President Hage Geingob and Swapo officials. Namibia's South West African People's Organisation (Swapo) is an exception among the liberation movements that became governments in Africa. As Namibia celebrates its 29th Independence Day on 21 March, it can look back on a period of increased consolidation of power. At the last elections in November 2014 it scored 80% of votes for the National Assembly, while its presidential candidate Hage Geingob garnered a record 86.7% of votes. Other liberation movements haven't fared as well in the role of governing parties. Zimbabwe's Zanu-PF is the most prominent case in point. For its part, South Africa's African National Congress had to part from its two thirds majority in parliament in 2009; in 2016 it lost control over most metropolitan municipalities. It faces tough elections on 8 May. ... parties whose origins lie in war, violent anti-colonial struggle, revolution, or counterinsurgency are more likely to survive economic crisis, leadership succession, and opposition challenges without suffering debilitating effects. They conclude that "revolutionary or liberation struggles also tend to produce a generation of leaders... that possesses the necessary legitimacy to impose discipline during crises". new ruling parties that emerged from violent struggle, such as Swapo in Namibia... appear to be more durable. Geingob is expected to be the party candidate again for the next presidential elections in late 2019. He is 77 years old. 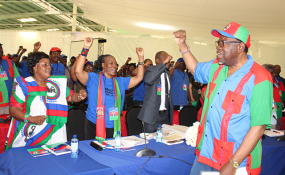 Swapo's political office bearers provide evidence of the party's gerontocratic structures. If the country's retirement age of 60 for public servants applied to politicians, its political bureau and central committee would have different compositions. In 2016 Geingob proclaimed the Harambee Prosperity Plan. It was based on an anticipated annual economic growth rate of 7%. At the time Angola's oil economy was already in shambles, and South Africa had begun on its rapid economic decline. One of Namibia's worst droughts was ravaging and the government's over-expenditure had drained the state coffers. We need to ensure that we are living in a just and fair society, a society in which the mantra of 'No Namibian must feel left out' permeates every facet of our coexistence. Other tensions have become visible too. A fall out between the Deputy Minister for Land Reform Bernardus Swartbooi and his Minister Utoni Nujoma (a son of Namibia's first President Sam Nujoma) led to Swartbooi's dismissal first from office and later from Parliament and Swapo. Previously regional governor in the Southern/Karas region, he founded a Landless People's Movement in 2017. It has since registered as a political party that's due to be launched in May. At a Swapo central committee meeting at end of August last year Geingob denounced those mobilising around the issue of land as "failed politicians" who were merely looking for personal gains. He accused them of playing with people's emotions, and warned that they could instigate civil war. The results of the next parliamentary and presidential elections should confirm Swapo's dominance. But it remains to be seen to what extent the house's foundations are cracking. On Independence Day not everyone who cheered the hoisting of the Namibian flag 29 years ago will be celebrating.